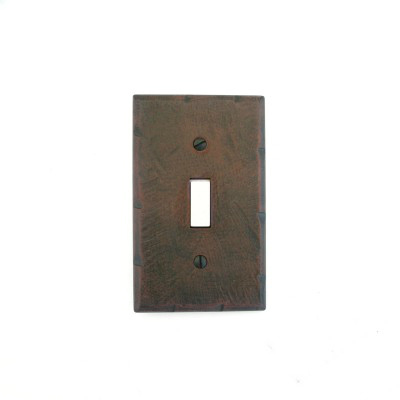 Paso Robles Ironworks is pleased to offer our line of Faux Iron Decorative Switch Plates. These polycarbonate switch plates have been individually hand tooled and strikingly finished in our rich metalic patina's by skilled artisans right here in our Paso Robles California design studio. Our decorative wall plates will give your walls the rich elegant look of hand forged iron at far less cost. Available in Iron Oxide, Aged Silver, Verdigris, Antique Gold, and Antique Black. Decorative Switch Plates, Outlet Covers, & Decora Style switch covers are available in most configurations. Safe, non-metalic, non conductive polycarbonate construction. Decora Style decorative switchplates fit switches, outlets and GFI's. Our telephone and cable switchplates include decora style inserts as shown in photos. All plates are standard size, please check to be sure you don't need oversize plates before ordering. Our guarantee: You will not find a safer, more beautiful product at any price. 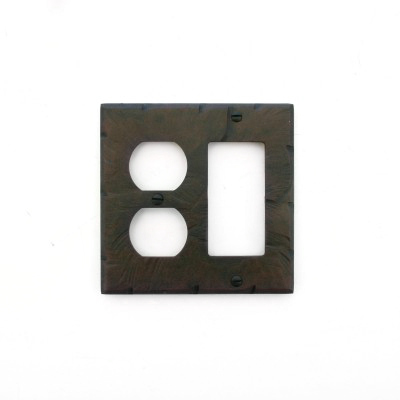 Decora single gang plate Shown in Iron Oxide, our most popular finish. Use this finish with Ivory switches or outlets (as shown) to complement that old world Tuscan or early California Mission look. The Decora switch plate and outlet plate are identical, we list them both to show both examples. 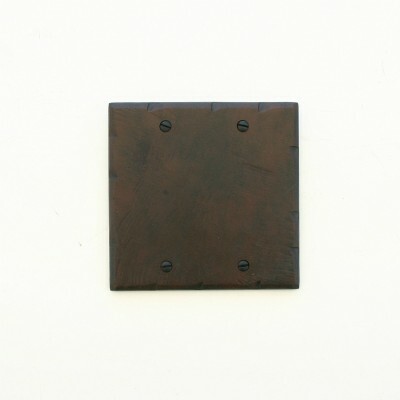 Standard size - 2.75" x 4.5"
Decora single gang plate Shown in Iron Oxide, our most popular finish. 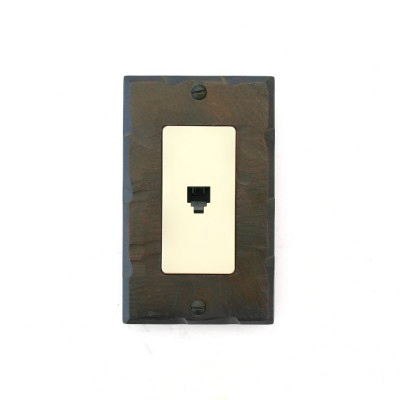 Use this finish with Ivory switches or outlets (as shown) to complement that old world Tuscan or early California Mission look.The Decora switch plate and outlet plate are identical, we list them both to show both examples. 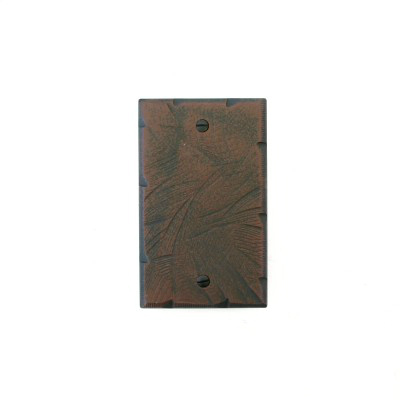 Standard size - 2.75" x 4.5"
Decora two gang plate Shown in Iron Oxide, our most popular finish. Use this finish with Ivory switches or outlets (as shown) to complement that old world Tuscan or early California Mission look. 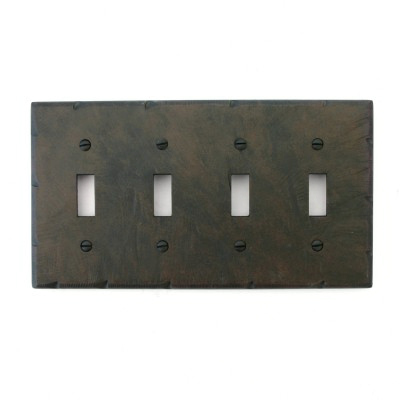 Standard size - 4.5" x 4.5"
Decora three gang plate Shown in Iron Oxide, our most popular finish. Use this finish with Ivory switches or outlets (as shown) to complement that old world Tuscan or early California Mission look. 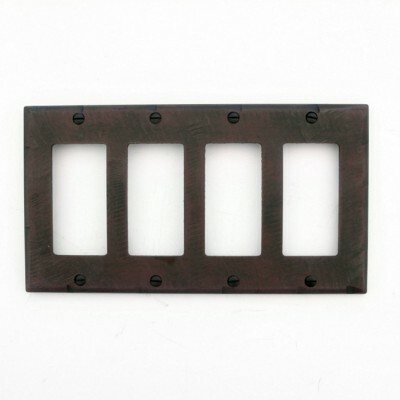 Standard size - 6 3/8" x 4 1/2"
Decora four gang plate Shown in Iron Oxide, our most popular finish. 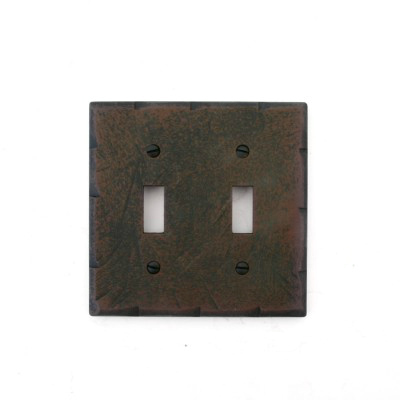 Use this finish with Ivory switches or outlets (as shown) to complement that old world Tuscan or early California Mission look. 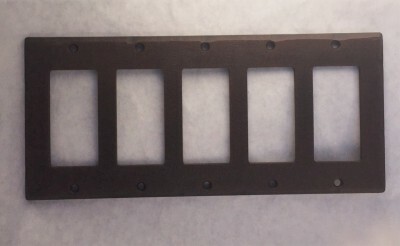 Standard size - 8 1/8" x 4.5"
Decora single gang plate Shown in Iron Oxide, our most popular finish. 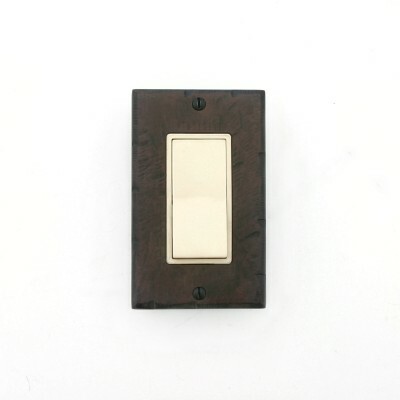 Use this finish with Ivory switches or outlets (as shown) to complement that old world Tuscan or early California Mission look.The Decora switch plate and outlet plate are identical, we list them both to show both examples. Standard size - 4.5" x 10"
Decora style cable jack shown in Iron Oxide, our most popular finish. 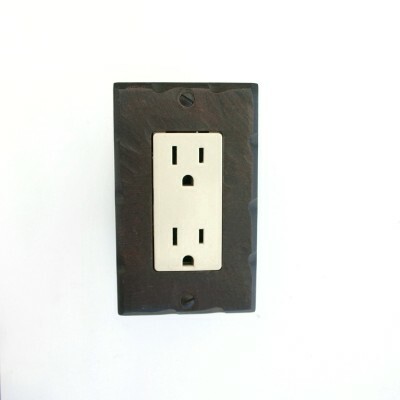 Use this finish with Ivory outlets (as shown) to complement that old world Tuscan or early California Mission look. Standard size - 2.75" x 4.5"
Decora style phone jack shown in Iron Oxide, our most popular finish. Use this finish with Ivory outlets (as shown) to complement that old world Tuscan or early California Mission look. 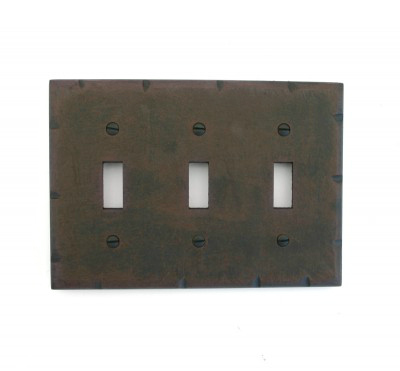 Standard size - 2.75" x 4.5"
Toggle style single gang switch plate Shown in Iron Oxide, our most popular finish. 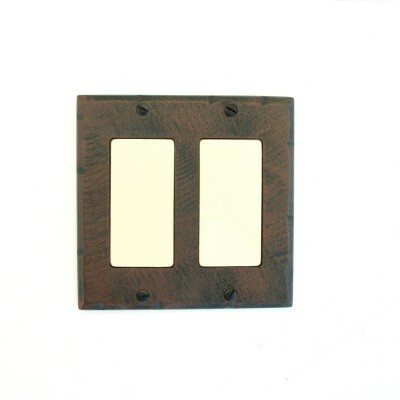 Use this finish with Ivory switches or outlets (as shown) to complement that old world Tuscan or early California Mission look.Standard size 2.75" x 4.5"
Two gang Toggle Shown in Iron Oxide, our most popular finish. Use this finish with Ivory outlets (as shown) to complement that old world Tuscan or early California Mission look. 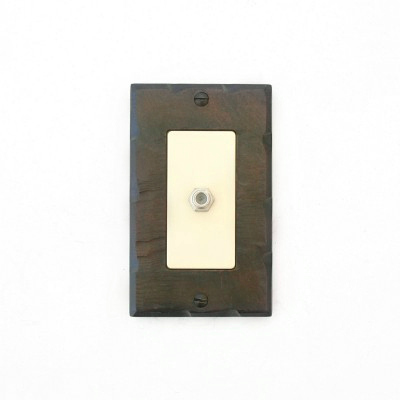 Standard size - 4.5" x 4.5"
Toggle style 3 switch gang switch plate Shown in Iron Oxide, our most popular finish. Use this finish with Ivory switches or outlets (as shown) to complement that old world Tuscan or early California Mission look. 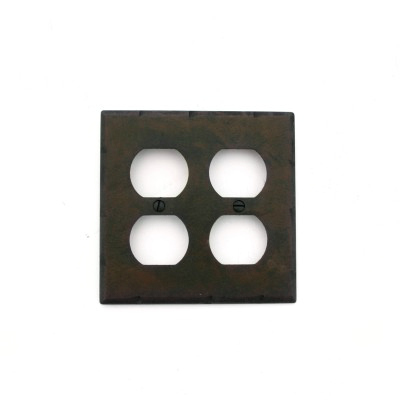 Standard size - 6 3/8" x 4.5"
Toggle style 4 switch gang switch plate Shown in Iron Oxide, our most popular finish. Use this finish with Ivory switches or outlets (as shown) to complement that old world Tuscan or early California Mission look. 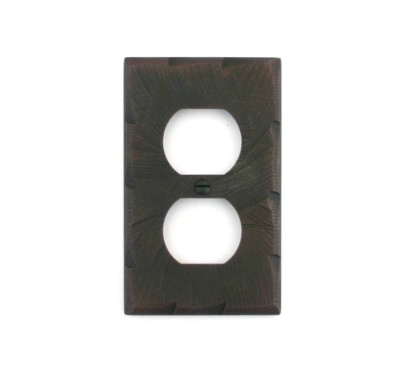 Standard size - 8 1/8" x 4.5"
Duplex Outlet Plate Shown in Iron Oxide, our most popular finish. Use this finish with Ivory outlets (as shown) to complement that old world Tuscan or early California Mission look. 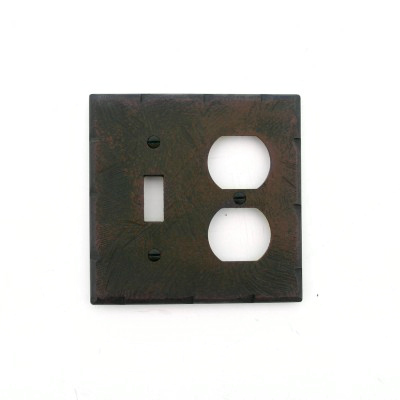 Standard size - 2.75" x 4.5"
Duplex Style 2 Gang Outlet Plate Shown in Iron Oxide, our most popular finish. Use this finish with Ivory switches or outlets (as shown) to complement that old world Tuscan or early California Mission look. Standard size - 4.5" x 4.5"
Yep, we carry most of the combo plates too. Please call or email us a photo of what you need if you don't see what you're looking for. Standard size - 4.5" x 4.5"
Two gang Blank Plate Shown in Iron Oxide, our most popular finish. 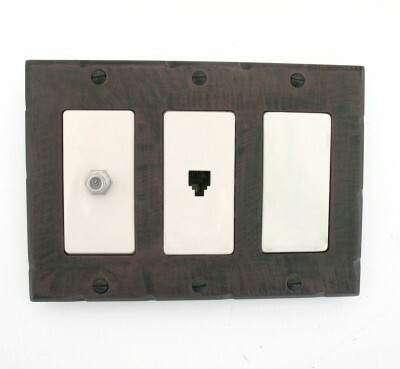 Use this plate to cover unused switch boxes, or can be drilled for rotary dimmers and cable connectionsto complement that old world Tuscan or early California Mission look. Standard size - 4.5" x 4.5"
Blank Plate Shown in Iron Oxide, our most popular finish. 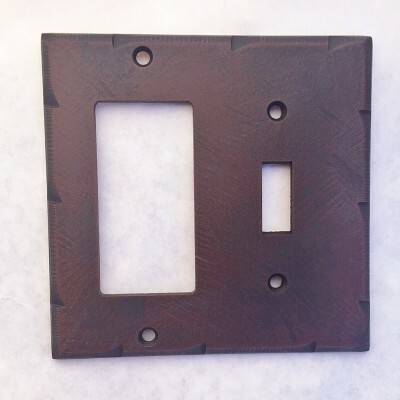 Use this plate to cover unused switch boxes, or can be drilled for rotary dimmers and cable connectionsto complement that old world Tuscan or early California Mission look. 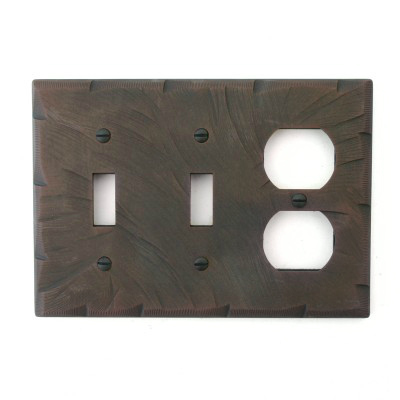 Standard size - 2 3/4" x 4 1/2"
Two Toggles and a Duplex Style Outlet Plate Shown in Iron Oxide, our most popular finish. Use this finish with Ivory switches or outlets (as shown) to complement that old world Tuscan or early California Mission look. Standard size - 6 3/8" x 4.5"